While much of this weekend will be occupied playing StarCraft II multiplayer—and likely spent very sad at the beatings I'll be receiving—I'll also spend some time slaying monsters cooperatively in Castlevania: Harmony of Despair. 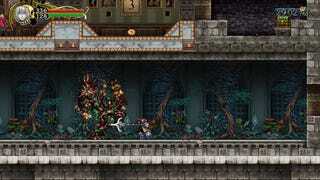 I've already logged an hour or two with the Xbox Live Arcade version of Castlevania HD, but not enough to learn its intricacies, nor enough to defeat that sonofabitch Puppet Master. Hate that guy. Watch out for a Kotaku review of Iga's latest Castlevania game—one totally not pieced together from reviews of previous Castlevania releases—next week. And while I plan to invest heavily in StarCraft II multi this weekend, I suspect I'll revisit some of the missions, explore the challenges and check out branching story opportunities I missed on my first play through. How about you? Did you finish StarCraft II: Wings of Liberty's campaign yet? If you're not a StarCraft player, what will you be spending your time with this weekend?